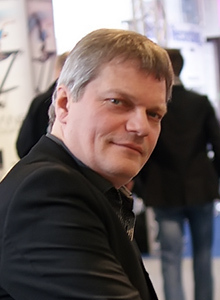 Jorg Schaaf is a musician, a sound designer. He participated in the development of such synthesizers as Quasimidi Quasar, Sirius, Technox, Rave-o-lution QM-309, Raven, Polymorph, Caruso. He developed Radikal Technologies Spectralis – a music machine that includes a modular synthesizer, a sampler and sequencers, with real-time control capabilities, Spectralis 2, Accelerator; Korg MS-2000; Access Virus and Eurorack standard modules. Jorg Schaaf has been welcomed to record albums of Klaus Schulze several times, one of the founders of the Berlin school of electronic music. Jorg is the true specialist, since he’s not only a musician but a connoisseur of musical equipment. He masterfully copes with both soldering hardware and performing, but you will sooner see him in demos and videos talking about synthesizer wiring or sound processing, rather than remember his compositions. Since 12 Jorg Schaaf has been into obsessing with Pink Floyd, especially the with their track “Shine On You Crazy Diamond” (1975), which was often put on by his sister who was 3 years older. He was impressed by the sound he heard and just hooked on this kind of music. Back then he didn’t know what a synthesizer is, but the interest of the young man gave rise to his professional work in the world of electronic musical instruments. Jorg started to walk around the music shops, listening to electronic hits in his headphones, to the radio, watching music videos on TV, getting into the subject, dreaming and already starting to invent something for himself. Many-minute Pink Floyd opuses taught Jorg serious music, and the search for something similar to it turned into a mere delusion. At the age of 14, his search for vinyl began with an assessment of the cover. An eye-catching cover hides some ear-catching music. He looked through the instruments featured on the album and got crazy when he saw the famous brands. He used to be fond of “Kraftwerk”, “Tangerine Dream” (“Stratosfear” album). He wasn’t a common music fan as any other was. He wanted to generate sound. As a 16-year-old boy, Schaaf bought himself a keyboard, which he had enough money for – it turned out to be Korg MS-20 – with which he entered the only band in his life – “Dannebroek”. That’s when he started to work on music processing, though he didn’t get inside of the unit, he already tried to make some elementary soldering by making simple noise circuits. Jorg could not produce a staccato with a Moog sequencer, and Minimoog was out of his league. Having sold his own Luxor, he expanded his Crumar Multiman S instrument with the String timbres, Hiwatt (tube amplifier), E-Voice Speakers 15L, the echo of WEM Copycat and Badstone Phaser Electro Harmonix after it appeared on the market on June 8, 1983. Then a variety of sound distortions were made with the help of an impressive selection of various effects, improvising with equipment, but this wasn’t enough. The very name of the band “Dannebroek” was understandable only to the Scandinavians, but for others it was devoid of any sense, and they played only psychedelic rock. Gradually coming to an understanding that creating alone is easier for him, Jorg said goodbye to his team and went on a one-man trip. After the band split, Jorg started making his own music. He started working in a music store and had the opportunity to use all the synthesizers that were presented in the keyboard section. He was swimming in music. He could already quite professionally record DAT with the C-Lab Supertrack. By the end of the 80’s, he performed solo, but, in general, was focused more on MIDI-sequences, rather than on “live” solos. That’s how “Virtual Network Traveler” appeared. Jorg used only Quasimidi Quasar for sound production. This was a challenge for Schaaf: to produce almost all the music with just one single instrument. He also applied Shakuhachi samples for a short Gregorian-style song, cello and some samples from the first Akai units. In order to perform with the help of Quasar, he converted samples to RAMBoard format. Unfortunately, this module didn’t get into mass production. With Klaus Schulze, Jorg took part in the Wahnfried project “Trance Appeal”. When asked what was the difference between Klaus Schulze and Wahnfried?”, Jorg said that Wahnfried was a band project, Klaus Schulze was a solo project, sometimes Klaus invited musicians to his solo albums, but that’s because he wanted the musicians to play his music, and in the Wahnfried project, you could either perform your own music or come up with something with Klaus, which is why the albums of the Wahnfried project differed from Schulze’s solo work. During the recording of his album “Sonar eXperience” with the classic “Berlin” electronic sound in “Turningpoint”, “Sequencia”, adjacent to the more experimental tracks “Fear 1, 2, 3”, there was a war in Yugoslavia. “Jorg felt very uncomfortable sitting in a quiet and cozy studio, when a lot of people died there, so he wrote several interludes called “Fear” to interrupt pleasant musical passages with a certain amount of acoustic horror. To strengthen the effect, he increased the volume while recording these parts. It must be awful to wake up at night because of bombing, screaming, and other “fanfare” of the war. These interludes were conceived by him as a way to at least partially reproduce this terrible state of mind. He recognized that he liked the atonal aspects of music. Jorg usually spent more time on the creation and development of some atmospheric sound, rather than on the music as such. His favorite track in this album was “Laydown Sonics.” It appeared to be very simple, and it took him no more than an hour to record it. Schaaf simply took the chords – even without using the metronome – and based on these improvised chords he found additional sound palettes. He said that’s how you create music – you just go with the flow… The album was released in 1999, the label “Ninetysix Sounds”. The album impresses with the first notes, each of which lets you feel the monumentality of the author’s works, each sound has a monstrous mass, there are no random sounds – everything is perfectly accurate. Even the lengthy introduction of “Awake” just makes you want to keep listening. It can be safely asserted that Schaaf continues the work of the aforementioned Klaus Schulze, presenting a modern vision of his intergalactic music, avoiding the global monotony of his predecessors, building more detailed pictures. Each work has its own atmosphere, sounds live inside, changing and rising, each note gives expressiveness and alters the general mood. The history repeats itself, it’s no surprise, and “Sonar eXperience” was one of the first harbingers of the Berlin school renaissance, musicians were coming back to massive monumentality of the works of the 70s. The album turned out to be great, it refused to follow the modern at that time tendency in electronic music, having made a spatio-temporal breakthrough. Jorg is a worthy successor to the glory of Tangerine Dream, Klaus Schulze, Ashra and others. While listening, you might feel that music has no boundaries, it develops and moves in any direction at any moment, and while the humanity makes its way through the vacuums with a snail’s speed, this album is the best opportunity to get acquainted with the farthest corners of the universe. When questioned how he found the scene of Berlin classic electronic music, Jorg thoughtfully replied that he didn’t even know when the last time he listened to this was. He was into progressive rock, Peter Gabriel, Genesis, Yes, Pink Floyd, he was no longer interested in “pure” electronic sound. When you develop synthesizers yourself, you lose the sense of magic of electronic music. Although, considering that the new Radikal Technologies Accelerator is being prepared for release and Soundcloud portal accepts more and more new music works made by Jorg for distribution, even if a bit of magic dissolved in hard work, creativity can’t be stopped anyway!